We offer a free quotation service. Please email us your files and all the relevant information we require (see below) and we'll return your email within one working day. If you have any questions about file setup, or any aspect of the laser cutting process, please feel free to get in touch. Oh, and check out our FAQs. Please read the following information on file preparation before sending us any files for quotation. By following these guidelines we will be able to process your orders quickly and efficiently. If you are unable to draw-up your own files, please send us an email with your drawings for a quote to have these created as vectors. Ideally we require a vector file in order to process orders. The formats that we accept are .ai (Adobe Illustrator), .dxf, .svg and .pdf. If you are unable to provide the specified files, we are able to work with almost any image. Depending on the format and quality of the image the setup fee will vary. Our laser cutter has a maximum workable area of 610mm x 457mm. The maximum sheet size we provide is 600mm x 400mm. Mirror Acrylic, Glitter Acrylic and Wood Veneer finishes have a sheet size of 600mm x 300mm. If you require larger sheets please contact us and we might be able to help. We have a wide range of materials to choose from, if you can't see what you are looking for, please let us know and we will try and get hold of it for you. This is a cut that goes all the way through the material. This is a cut line that just marks the surface of the material and does not go all the way through. We have a standard optimised depth that marks the surface. This is when you require a filled area on the surface of the material to be engraved. We have a standard optimised depth that marks the surface (0.03mm), if you require a specific depth please let us know. Please layout all the items you would like cut in each colour as shown. This is one sheet. If you need six necklaces you must layout six necklaces on a sheet - even just for a quote. You must make sure you leave at least 2mm between each individual object. It is also important that your cutting sheet file is no larger than 600mm x 400mm (or for glitter, marble, mirror or wood veneer finishes 600mm x300mm) as this is the maximum sheet size we provide. When preparing your files it is important that you don’t have duplicate lines hidden close together or on top of each other. The laser cutter will include all lines on the file in the cutting process. If you do not remove these lines they can cause burn marks and will mean the cutting takes longer, which will cost you more. 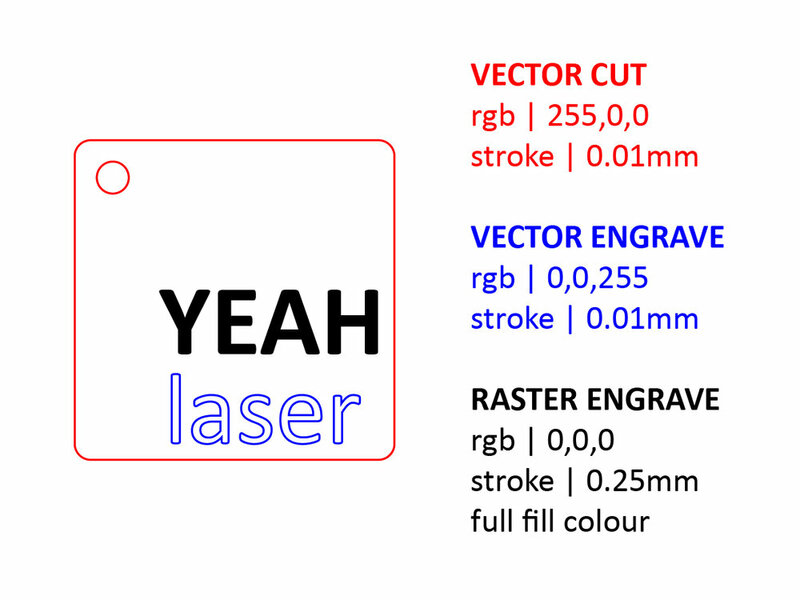 Make sure you have removed all “clipping masks” as the laser cutter does not register images that use this tool. Once you have received your quote and confirmed your order it should take us around 3-5 working days to process and dispatch. If it is a busy period, this could be longer, but we will let you know when we provide your quote. If you need a quicker turnaround, please let us know and we will quote for a Rush Job. We offer free local delivery in the central Brighton area, please check the map to see if you are within range. We also ship orders nationally and internationally at standard rates via Royal Mail Signed For. • Make sure your file is set to RGB colour mode. • Ensure that the file has no hidden / double lines. • Remove all clipping masks. If you have ordered with us previously please just provide files and a brief explanation of what is required.